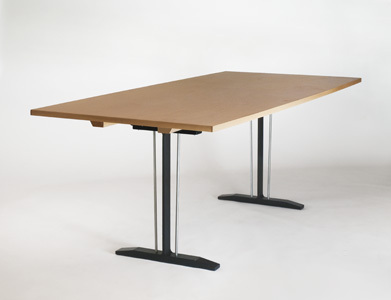 The Partners Table is supported by a version of our stabilized beam design. Combining this support assembly with an Appleply tabletop results in a lighter table with a high proportonal core weight. The end cantilevers of the these tables are reinforced with maple stretchers that fit inside the steel trestle frame. Shown with black shoes and a maple edgeband. Width 36" Length 72" Height 28.5"